so long, felix. we hardly knew ye. while we think viroqua, our new hometown, has a lot to offer there’s no doubt that living in one of poorest counties in wisconsin comes with unique challenges particularly if you are a small business owner. soon after we moved no less than four local businesses folded, including two pharmacies that had been in business for over a hundred years – the casualties of a new and very controversial walgreens store. 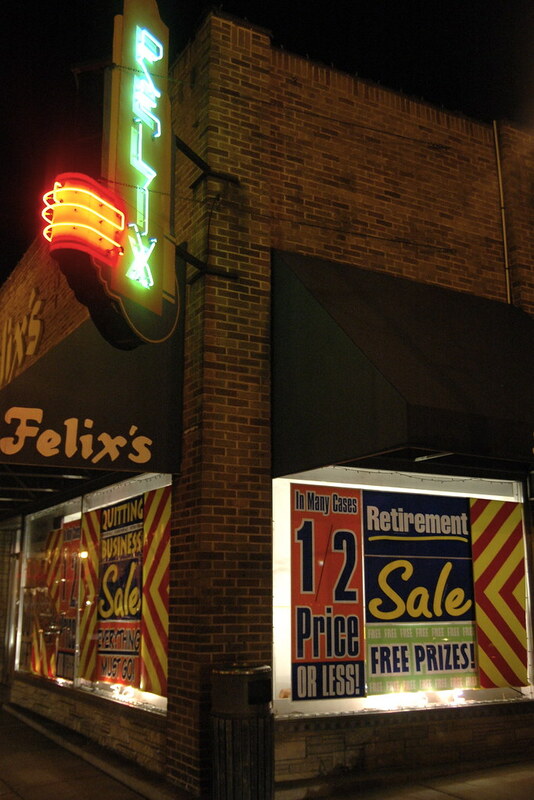 adding insult to injury felix’s, a local clothier that had recently celebrated a 100 years of service to the local community, announced that it would be closing its doors. and it’s not like this is a new phenomenon. our insurance saleman was forced to sell his shoe store that had been owned by his family for decades because they couldn’t compete with the local walmart. according to him, five other shoe stores also went out of business ( it’s astonishing that such a small town could support 6 shoe stores in the first place ). while there’s a vocal contigent of residents that believe that doing business locally is key to making local economy sustainable, it seems that most residents are voting with their wallets at the big box stores. "Driving a Prius might induce raptures of eco-moral superiority, but changing the zoning laws would produce a better outcome — and that’s just too hard." i’d like to think he’s being pessimist, but at the rate the independents are disappearing around here, i guess maybe he’s just a realist.